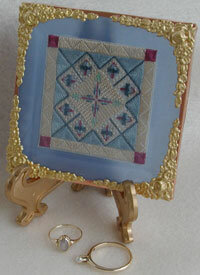 Create stunning miniatures using silk threads on 40 count silk gauze. A bit more challenging, but worth the extra effort! 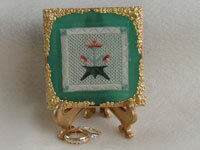 Approximate finished size of each of the miniatures is 2” x 2”. Tiny clusters of Bleeding Hearts spread across the silk gauze creating a tiny work of art in shades of pink, raspberry and green silk. Jessicas, Mini-mistake stitches and Rhodes Hearts are the central stitches, surrounded by Alicia Lace. Silk Gauze for the beginner. 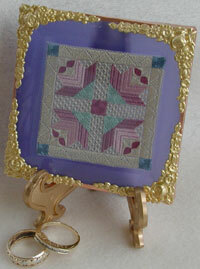 Use your stash of silks in the colors of your choice to learn Silk Gauze embrodery. Approximate size of the design is 2" x 2". 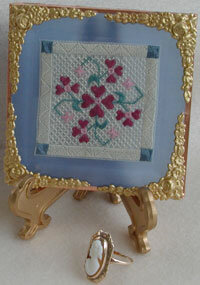 This classic quilt design has been transformed into a lovely miniature. Carolina Lily is worked in soft peach colors using a variety of stitches, including Amadeus, Sprat's Head and Kalem. The delicate blooms of this diminutive Florentine Iris are worked in shades of blue and mauve. Rhodes, Mosaic, Amadeus, Sprats Head and Alicia Lace come together to create a miniature masterpiece. Mauve and green are the colors in this garden, with texture and depth from stitches like Waffle and Amadeus. Another lovely miniature. 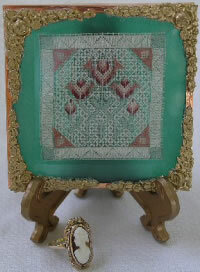 Another stunning miniature worked on 40 count silk gauze in shades of peach, rust, and green. Uses Soie Cristale Silk and Anchor floss. Another in the series of Christmas Silk Gauze designs. 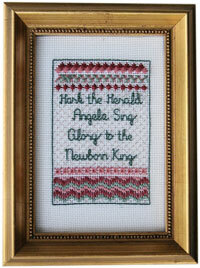 Celebrate the Christmas season with this delightful miniature in silk gauze. 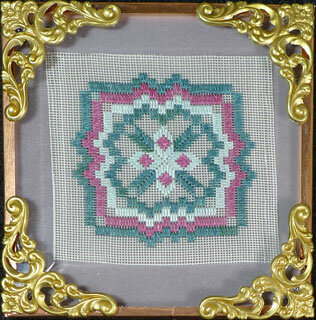 Sampler bands combine with Alicia Lace to create a piece that is delightful to stitch whether on silk gauze or Congress Cloth. 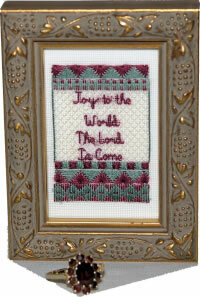 Decorate for the Holidays with this miniature Christmas Sampler. Worked on 22-count Congress Cloth for a wonderful accent piece, or 40-count silk gauze for a truly unique ornament. Either way, you will love stitching this enchanting design.